SykoGrafix: Art - Stuff - Ninja Insanity: Pikmin Power. So far this year, I've really been getting into video game collecting. Well, I've always collected video games and kept everything in good shape, but that just seemed like normal to me. Now I'm really into the scene, trying to get the best prices I can on both new and classic titles. It's not simply that I want to play them, but I just think it's fun to collect them. So, I've bought a lot of games. A lot of them I bought for $10 or $5 or even as low as 99 cents in a few cases. Let me tell you, it's hard to go back after that! Mostly, this means I buy used games, but I have bought a few brand new, sealed games if they're on sale or if the retail price isn't $50+. In fact, out of all the games I've bought over the past 2 years, there is only one game that I paid the full $60 retail price for, and I did so gladly, because that was Pikmin 3 on Wii U. Of course, I am a huge Nintendo fan, and obviously I love the Mario games, but among the various Nintendo franchises, the Pikmin series really stands out as being extra special to me. The gameplay is very unique. You control a tiny character who, in turn, commands a legion of tiny creatures called Pikmin, and you use these creatures to accomplish your tasks. There is really nothing else like it. But beyond the actual gameplay, there is a strange psychological element present. You are basically manipulating an entire species into doing your bidding. They seem incredibly eager to help, but really, they are just your tools. You throw them into battle against other, larger creatures as if their lives meant nothing to you, often to see several of them devoured or squashed. This is not really a big deal, as you can just go make more, and it's not like you ever interact with them on an individual basis. But when a Pikmin dies, it lets out a death scream that is full of just as much sorrow and disappointment as it is horror. Is it crying out in pain as its life expires, or is it sad that it failed you? Whatever it is, it creates complex feelings as you play, and you simply can not help but be drawn into it. The in-game text has a clever writing style that enriches the game's universe, adding a lot of humor and depth to the characters. It also raises interesting questions that add to the emotion of the game. While it may seem that you are exploiting the Pikmin, maybe they want to raise their status in the ecosystem and are actually exploiting you in order to get there! I've been looking forward to Pikmin 3 since it was officially unveiled at e3 in 2012. In fact, I was so excited that I pulled out the original Pikmin for Gamecube and played it again. I still couldn't beat the very last boss though. Leading up to the long awaited (and unfortunately delayed) release date this summer, I played through both Pikmin and Pikmin 2, though this time with the Wii New Play control versions. I was able to complete both games, and the added motion control was a great way to play. I enjoyed playing them, but I was a bit worried that I'd be tired of playing Pikmin by the time Pikmin 3 came out. Nope! I love it! 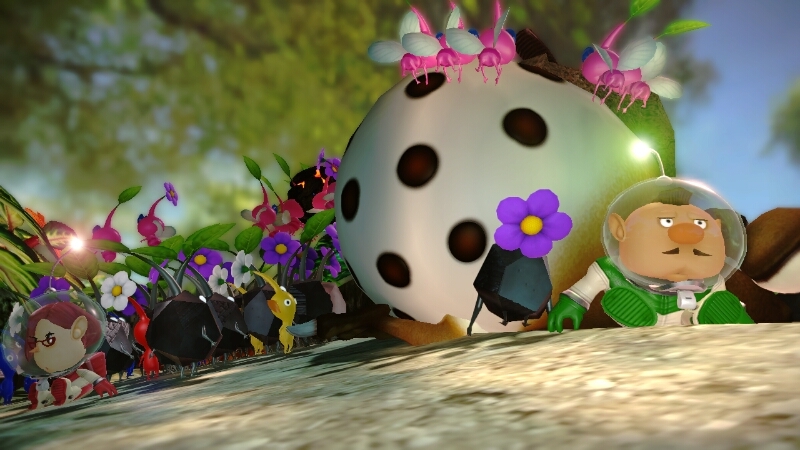 Pikmin 3 is the most enjoyable and robust entry in the series. Gorgeous HD graphics, rich sound effects, smart dialoged, and absolutely perfect controls with Wii Motion Plus which prove that motion controls are not just a gimmick. It's one of Nintendo's most polished games. The only down side to the game is that it ends, and even though it's about twice as long as the original Pikmin, I still wish it was longer just so I could enjoy playing it more. But even after completing the Story mode, I'm still playing it though the endlessly replayable Mission mode, where it's all about getting the highest score you can in a short time limit. Pikmin is kind of an underrated series for Nintendo. It's been a long time since a new entry has been released, and the franchise doesn't have the same exposure as Zelda or Metroid. 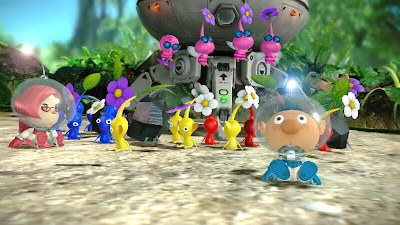 Now that the Wii U is starting to come into its own with some great upcoming titles and a lower price, I am hoping that people who are looking into the system and are looking into what games are worth playing will give Pikmin 3 a try. It works perfectly as an introduction to the world of Pikmin even if you've never played a Pikmin game before. There's never been much doubt that Pikmin 3 would be a great game, but I can safely say that if it could get a cheapskate like me to pay the entire $60 plus tax retail price and not regret a single penny, then it must be freaking spectacular!